The Prosperity Challenge: It's Time for More! If you’re looking to have more in any area of your life - whether it be career, business or personal - we invite you to join the Prosperity Challenge. You will be coached through the challenge utilizing the Accelerating Abundance Program. In this 7-Module Course, you’ll learn to transform the energy you put into life and improve the speed with which you attract abundance. Use these tools to manifest what you want more effortlessly. Make the law of attraction work for you. 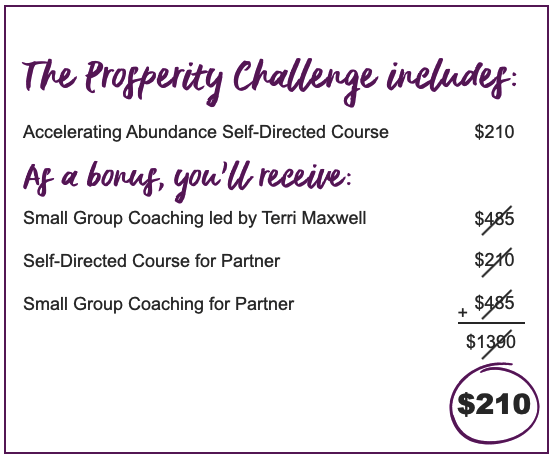 Step 4: Begin the Prosperity Challenge and make 2019 the most abundant year ever!